The tawny frogmouth may look like an owl at first glance, but it's a completely different type of bird . They live throughout Australia and in all types of habitats. Its beak is designed to catch insects such as cicadas and beetles. It also feeds on small rodents or frogs occasionally. Unlike the owl, the tawny frogmouth is a poor aviator . This species will wait silently for its prey to approach, pounce on it and return to its position. Ama rests on mature trees with thick, dark bark because they make them almost invisible. The general plumage of the tawny frogmouth is silvery gray, slightly paler underneath and mottled in black . There is also a second species of reddish plumage. The eye is yellow in both and the bill is olive gray to blackish. The birds of the southeast are larger than those of the north and can reach between 40 and 50 centimeters in length . The tawny frogmouth is a night owl. During the day they perch on the branches and camouflage themselves as part of the tree; they usually communicate with a soft, deep and continuous sound. They also make a loud whistle when they feel threatened. This species has a broad, flat beak, unlike the owl, which is narrow and more hooked. Tawny frogmouth claws are weak and lack of curved claws . In winter, their food supply will be reduced so much that they will spend much of their days and nights in torpor. They stay in torpor, a state similar to hibernation in which the heart rate and metabolism decrease significantly to save energy On colder days, especially autumn and winter, they will choose a sunny spot on the north side of the tree, while in summer they usually choose a south-facing location. 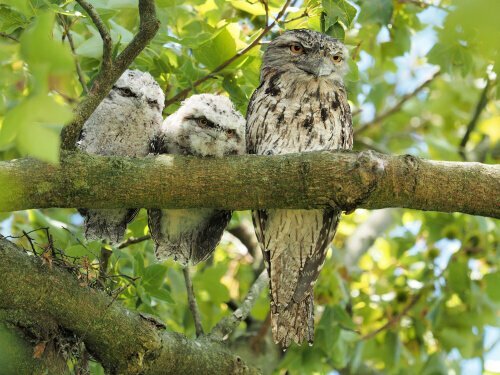 The tawny frogmouth has a regular breeding season, but birds in more arid areas can breed in response to heavy rains. This bird chooses a companion for life . The couple will usually lay two eggs together each year and will take turns sitting on them and keeping them warm until they hatch. The nest is a loose platform of sticks, which is usually placed on a horizontal bifurcated tree branch . The sunset is one of the best times to observe them and, during the fall, it will be easier to see them because they will be busy in the excessive intake of insects before they begin to hibernate. During the day , their beautifully designed feathers are mixed with the bark of the tree, which makes them very difficult to detect . The feathers of tawny frogmouth are not their only unusual feature; its big and wide beak gives them the name of ' frogmouth ' or frog mouth. These birds love catching insects caught in the air at night . They also eat slugs and snails, and even small mammals like mice. It is a great animal to have in your backyard because, while you sleep, you are busy keeping the number of pesky bugs in your garden at bay. To avoid detection during the day, they sit upright, completely motionless on the branches of the trees , with their heads tilted up and their eyes closed to the slits. For anyone who sees it, it will look like the trunk of a branch of a tree . With their eyes closed, they hope that what scares them can not see them and then disappear. If a frog mouth is disturbed, it can adopt a threatening posture : sponge its feathers , shows his wide orange eyes and opens his beak in a wide opening to reveal his yellow throat, hoping to look intimidating. 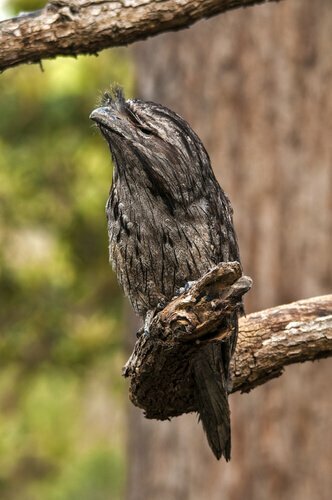 Even though it is known as the bird with one of the deadliest looks in Australia , the tawny frogmouth is one of the most beloved species of that continent.